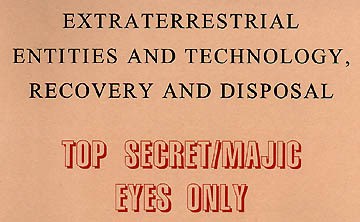 Title on "Restricted SOM1-01 MAJESTIC-12 Group Special Operations Manual," dated April 1954 with War Department logo. Also see Earthfiles 021202. Updated with maps on November 16, 2002. November 9, 2002 Broomfield, Colorado - Since the mid-1990s, aerospace engineer, Robert Wood, Ph.D., and his son, Ryan Wood, a mathematics and computer science professional, have taken on the challenge of trying to prove - or disprove - the authenticity of several hundred pages of allegedly leaked U. S. government documents about "flying saucers," "extraterrestrial biological entities" and "interplanetary" technologies. Their main source has been a man named Timothy Cooper whose father worked at White Sands in the 1940s. Twice Timothy has found in his mailbox a large stash of alleged classified government documents from one or more anonymous sources. The latest delivery was July 2001 and the postmark on the package was "from Virginia." Next PostNext What Happened 11,000 Years Ago That Killed So Many Animals?